At the beginning of the 1909-1910 Pennsylvania League season, Kensington’s Hibernians, the reining league champs, seemed a sure bet to repeat as champions. But the Tacony team had other ideas. Led by what the Philadelphia Inquirer described as “the splendid half-back line” of team captain Hector McDonald, former Scotland junior international Robert Morrison, and Percy Potts, the Tacony team defeated the Hibs 2-0 on October 23, 1909. 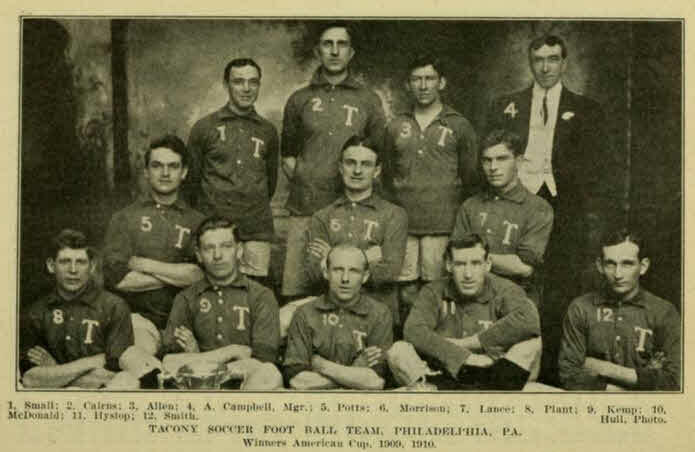 The Hibs would prove their resilience when they gave the visiting English team The Pilgrims the first loss of their 1909 tour a few days later, but Tacony would never look back in league play and would dethrone the Hibs as champs. Along the way they would also win the American Cup. It will probably come as no surprise that the history of English football snobbery directed toward America is almost as long as the history of the game itself. But such snobbery is not necessarily a bad thing. In 1905 and 1909 a team of gentleman amateurs called the Pilgrims landed in America to show the natives a thing or two about how the game ought to be played. Kensington’s own Philadelphia Hibernians had a few lessons of their own to share. This concludes the two-part “Great Philly Soccer Teams: Philadelphia Atoms.” You can read Part I here. Before Atoms coach Al Miller took the young team to England to train and to scout for some British players to fill out the roster, back in Philadelphia, Atoms general manager Bob Ehlinger’s marketing skills were put into play. In addition to players,the team needed a name. So a name-the-team contest was held with the winner being awarded an all-expenses paid to the FA Cup Final. Press coverage was cultivated. Given the woeful state of Philadelphia professional sports at the time, the local press enthusiastically covered the new team. Favorable coverage was aided by the fact that throughout the season Miller proved to be a natural with the press. The Atoms first game was away to the St. Louis Stars. Like the the Atoms, the Stars also fielded a squad filled with Americans, as they had done for years. It proved to be an inauspicious start as the Atoms lost 1-0 in front of a paltry 6,782 spectators. Concerns about whether the Atoms would be any good aside, some wondered if teams filled with Americans would be able to draw fans: with the exception of the Stars and Atoms, only 19 Americans were on the rosters of the other seven teams then in the NASL. Philadelphia soccer history has many important examples of teams that were backed by businesses: the John A. Manz team, who in 1897 became the first team from outside of Southern New England/Northern New Jersey to win the AFA’s American Cup, was backed by a brewer; Bethlehem Steel FC, the most dominant team in American soccer of the 1910s and 1920s, by the steel company; Uhrik Truckers, winners of two ASL championships in the 1950s, by a trucking company. All of these teams, however, competed in leagues that were either amateur or semi-professional against teams that were largely backed by the kinds of ethnic social clubs that have contributed so much to American soccer history. In the years immediately following the codification of the rules of football in 1863, soccer as it was played would have borne little resemblance to the game we see today on television, let alone play informally with friends or formally in organized leagues. Some differences would have been obvious. For example, goal kicks weren’t introduced until 1869 and goalkeeper wasn’t a recognized position until 1872. Crossbars weren’t mandatory on goals until 1882 (tape or a section of rope was typical before then), nets weren’t required until 1892. It wasn’t until 1909 that the goalkeeper was required to wear a differently colored shirt than his teammates and not until 1912 was he restricted to handling the ball only in his own box. It is very difficult to overstate the importance of the Lighthouse Boys Club not just in the history of soccer in Philadelphia but in the history of soccer in the United States. Aside from providing the richest source of soccer talent for Philadelphia clubs at all levels of the game for much of the 20th Century, Lighthouse also provided a model for the community-based soccer clubs that were intrinsic to the youth soccer boom that began in the 1970s and continues to grow to this day. The Lighthouse Boys Club, which was established in 1897 at a building on Lehigh Avenue was itself a project of the social reform organization The Lighthouse. Founded by Esther W. Kelly Bradford, The Lighthouse can trace its beginnings to the establishment of a settlement house in Kensington in 1893. The purpose of the organization was to provide the residents of Kensington and North Philadelphia with “an alternative living and social space in which neighbors could mingle, train for employment, take advantage of educational opportunity and locate necessary resources for day-to-day living.” The absence of government assistance programs combined with the unstable economic climate of the late 19th century and early 20th century insured a valuable place for The Lighthouse in the community. In the first month of the Lighthouse Boys Club’s existence, 350 boys joined. Membership grew so rapidly that by 1902 a new center was opened on Somerset Street. By 1924, the Boys Club had 19,000 members.